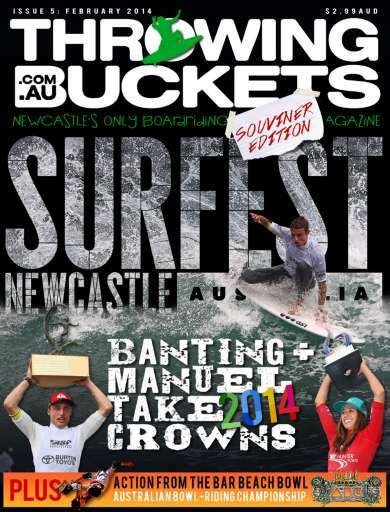 This month's edition is a bumper 170-page Surfest Souvenir edition. We have Surfest covered from all angles with a tremendous array of action photos from all the major events. Also we have pictures from the Australian Bowl-Riding Championship held earlier this month. Our bikini girl this month is the gorgeous Zoe Bunting - pictures taken by the talented Phil Stefans. And of course we have Jet Waves for all of our surfing Jet Fans. 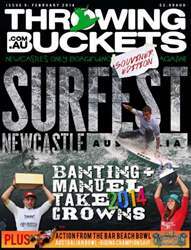 We have Lion Fins to giveaway and you could also win a throwingbuckets t-shirt and hat pack. All inside this month's massive edition!